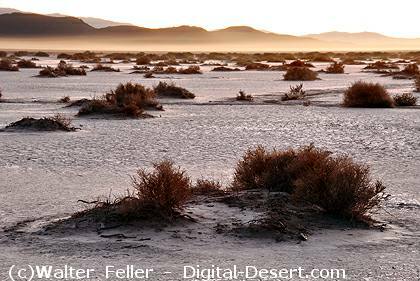 The areas of interest include El Mirage Dry Lakebed, the Shadow Mountains, El Mirage Basin, and the Twin Hills area. This makes up a 24,000 acre of public and private land. 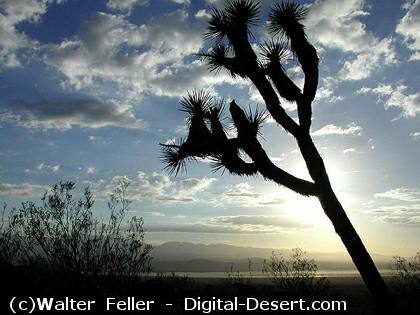 Elevations range from about 2,800 feet at the El Mirage Dry Lake to more that 3,800 feet in the Shadow Mountains. During summer months, temperatures can reach a high of 120 degrees F. Summer thunderstorms can come with spectacular force, although most of the minimal precipitation falls during winter months. Winter lows can fall to 5 degrees F. at night, with highs in the 60 to 70 degree F. range during the day. Spring and Fall temperatures are moderate and fall between these extremes. 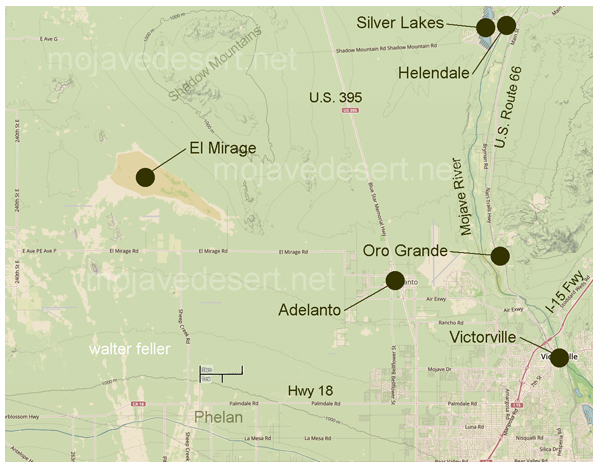 The El Mirage OHV riding area is located west of Adelanto, California, between US Highway 395 and the Los Angeles County line. Most visitors enter from US Highway 395 near Adelanto by taking Chamberlaine Way (formerly Crippen Avenue) west to Koala Road. Turn right on Koala Road and follow the signs toward the town of El Mirage. At El Mirage Road, turn left. Just east of the town of El Mirage, take Mountain View Road north to enter the El Mirage OHV Recreation Area. A sign located at this intersection will direct you to the recreation area. If you are coming from Palmdale, take Palmdale Boulevard eastbound and turn north (left) at 240 th Street . Turn east (right) at Avenue P. At the San Bernardino County line, Avenue P becomes El Mirage Road. Follow El Mirage Road through the town of El Mirage. Just east of the town of El Mirage, take Mountain View Road north to enter the El Mirage OHV Recreation Area. A sign located at the intersection will direct you to the recreation area. The speed limit on Mountain View Road is 25 mph. Speed bumps are placed to control speed. Only street legal vehicles can use this paved access road. Note: There is a perimeter fence around the area to limit access to selected routes. The entrance is on Mountain View Road. Boundary maps are available at the Visitor Center on Colusa Road. To prevent trespass into the town of El Mirage. This is a major concern for local residents and is the highest management priority in the area. To aid in the management of the lakebed. When the lakebed is closed due to being wet or muddy, it is easier to notify the public and enforce the closures with the fence in place. To discourage route trespass. There is only one legal public access to the riding area; Mountain View Road. All others that were used in the past are on private land. A right-of-way was purchased using Off-Highway Vehicle Funds. The perimeter fence encourages the use of this legal route. Most visitors ride motorcycles, ATVs, or tour in four-wheel drive vehicles. There is a road network in place so visitors may camp in most sections of El Mirage. This area is also used extensively for competitive racing events and commercial filming by permit. El Mirage's unique flat lakebed is a destination for many visitors. There is ultra-light and other aircraft activity that would not usually be found in other riding areas. There are several opportunities for hiking, rock scrambling, rock hounding, and wildlife watching. El Mirage has desert tortoises, a state and federally-listed threatened species. Note: There are many deep mine shafts in the riding area! Please avoid these areas and camp away from mine shafts! The lakebed is a flat playa formed in an undrained basin. Silt and clay are deposited into this basin during periods of heavy rain. 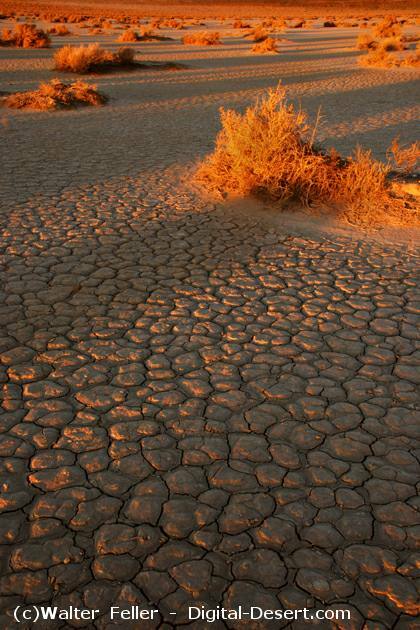 When the "lake" dries, a hard pan dry lakebed is left. This hard, smooth surface is ideal for the unique activities conducted at El Mirage. These include ultra-light aircraft and gyrocopter flying, model rocketry, remote control airplane flying, landsailing and straight track racing. Many private pilots land on the lakebed to spend the day. The surface character has attracted the interest of many filming companies. Several major movies have scenes filmed here. There is no speed limit on the open lakebed, but vehicle operators are responsible for their own safety, OHV rules and regulations, and knowing what is going on around them. The maximum speed limit is 15 miles per hour within 50 feet of camps and staging areas. During permitted events, special speed limits and traffic restrictions are posted. Please watch for these events. To maintain a smooth surface, the lakebed is closed when wet or muddy. The California Highway Patrol, San Bernardino County Sheriff, and BLM Rangers patrol the area to encourage safe use by visitors. Camping is permitted on the lakebed, but no more than 100 feet from the edge. This keeps the smooth center section of the lakebed clear for night riders. The basin between the lakebed and the Shadow Mountains is covered with creosote bush and crossed by deep dry washes. Most Off-Highway vehicle use occurs here. Along with casual recreational riding, many OHV and motorcycle clubs stage "runs", and competitive races. Riding is mostly over easy terrain, but visibility can be obscured by six to ten foot tall creosote bushes. Many flat and secluded areas for camping are in this area. The Shadow Mountains are a group of eroded igneous peaks bordering the northern edge of the riding area. These mountains run through the center section and east of the main access, Mountain View Road. The Shadow Mountain peaks offer moderate to hard riding terrain, and are a challenge for experienced riders. Canyons within these mountains make excellent camping areas and offer seclusion for four-wheel drive campers. Watch for open mine shafts in these areas. The Twin Hills area is on the east side of the riding area between the Little Shadow Mountain group and US Highway 395. This flat basin is punctuated by small mound-like hills and gets light riding activity. There are camping possibilities here, but motor home campers might find driving in this area difficult. Permits will be available for sale on-site using a fee machine. The on site fee machines take cash and credit cards. Please bring exact amount of the pass, the machines do NOT make change. The fee machines at EL Mirage sell daily, weekly and annual passes. Vehicles operated on bladed dirt roads and paved highways (publicly maintained roads) must be registered for highway use. These roads may be crossed at a 90-degree angle by Off-Highway vehicles, but are not to be used for travel. (38025 CVC) All required safety equipment must be installed on such vehicles. Off-Highway Vehicles owned by California residents must be registered with the California Department of Motor Vehicles and must display a valid "Green Sticker" registration plate properly on the vehicle. (38010 CVC and 38170 CVC). On the ground, motorized vehicles should yield to non-motorized craft and aircraft. The lakebed is closed to all users where wet or muddy. Please help Protect Joshua Trees. 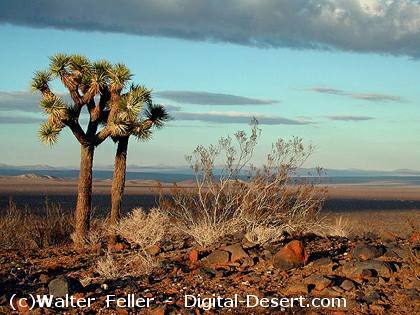 Joshua Trees are protected. It is prohibited to dig up, remove, or destroy any tree or shrub. Bring your own nail-free firewood. It is illegal to leave litter on public land. (43 CFR 4140.1 (b(6)).